This weekend was a wonderful blur-I attended my first SCBWI (Society of Children’s Book Writers and Illustrators) Conference-my reason for coming out to New York in the first place, and I now feel filled with a renewed sense of purpose. The people I met were fantastic and each one of them had such passion and energy for their writing plight-agents, editors, writers, illustrators-that I knew I was with the right group of people. The words the keynote speakers shared with us resonated at my core, and I knew that this feels right, and I took it all in with childlike wonder and curiosity. And it’s true. No matter how the times or technology changes, at its core childhood and the experience of being a child remain the same. So when writing for children, we must go inward and remember what it was like for us as children. The adults I was surrounded by this weekend all maintain that youthful, childlike curiosity of the world, and they’re constantly seeing magic and wonder, where so many others may only see the mundane. I think that’s a really important life lesson-regardless of whether you’re a children’s writer or high powered executive, never settle for complacency; always challenge yourself with the unknown. On the subway leaving the conference, I shared the platform with only a few other people who were all slumped against the wall. I was lost in my thoughts, in-taking everything I’d just learned at the conference, and not really paying attention to the others around me when a guy near the center of the platform caught my eye. He walked away from the wall to stand at the edge of the tracks and looked down. At first no one did anything, most likely they didn’t even notice. But he continued to look down, and eventually a couple of the people near him walked to the ledge and looked over too, causing the people near them to do the same. Eventually everyone on the platform (myself included) had walked to the edge and was peering down at the tracks below to see what was so interesting, at which point the first guy walked back to lean against the wall. All I saw were some dirty coffee cups and bits of torn trash strewn about, but it amused me that this one guy and his gesture had piqued the curiosity of everyone around him. It’s there, our childlike curiosity and wonder, but I think we sometimes let our rational thinking self believe there’s nothing there, so why bother to look over that ledge? Often there will be nothing but strewn pieces of trash, but we may miss something if we don’t look. I’m excited because I’ve found my people-people who play with words and language and ideas-who are quite possibly crazy because they spend their time talking to imaginary people they create, trying to figure out who they are and what they’re doing, where they’re going. This conference showed me new ways to put words together and I listened to beautiful speeches that in essence were telling the same story of hope and desire and dreams, and the knowledge that we, that I, can make them happen. I’m excited to jump off that cliff, and learn to build my wings as I go. The hilarious Jim Benton, creator of Happy Bunny and countless other cartoons and books, and was called “the most visible cartoonist in America” by people magazine (chances are you’ve come across his work and you don’t even know it!) Here he talks about the Compulsive Creator, while drawing a cartoon of a platypus falling in love with a blender to create a blended family! 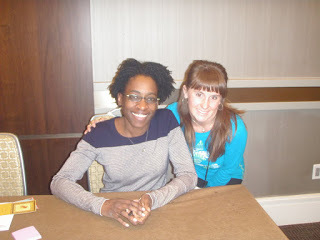 Jacqueline Woodson spoke to us about the importance of writing in today’s world, and did a beautiful reading of her children’s book “Show Way”. 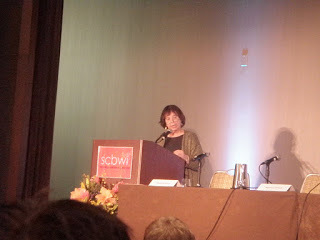 Jane Yolen has written over 300 books for children and young adults, and is still going! She wrote “The Devil’s Arithmetic” and “Owl Moon” (amongst others you may have read as a child!) and gave us her list of 20 Writing Tips to Live By…the most important of which was merely…to write. 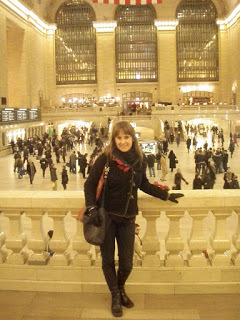 The conference took place at the Grand Hyatt, which sits above Grand Central Station. After seeing this place in so many movies and shows, I figured I had to stop and pose for a picture! 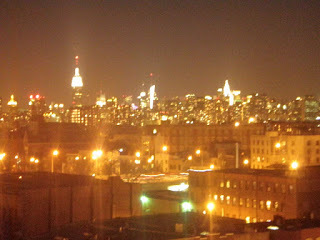 On my last night in New York, Seema and I had a lovely dinner together, then came back to her apartment and went up to the roof. 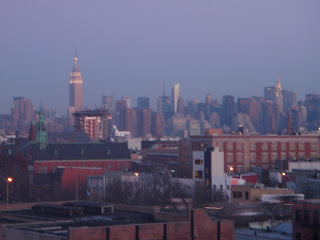 She has a stunning view of Manhattan (you can see the Empire State building), and that night was a full moon too. The next morning we awoke early to catch the sunrise, and here is that same view from the roof only hours later in the early morning twilight…a bit of a different feel but equally beautiful. It is exciting to see you get so excited, Carolyn! Inspiring even, I am glad that you are taking this literal and metaphorical leap into your writing career. I know you will be amazing. 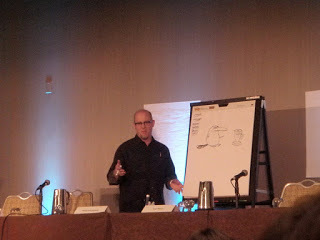 In it he describes going to one of these conferences to learn about how to create a bestseller story. His entire book turns out to be about what he learned along the path of attempting to achieve this goal, including many epiphanies on God, life and relationships. I hope that through this whole process you can come away with much vigor and passion to help inspire you to write something as well!